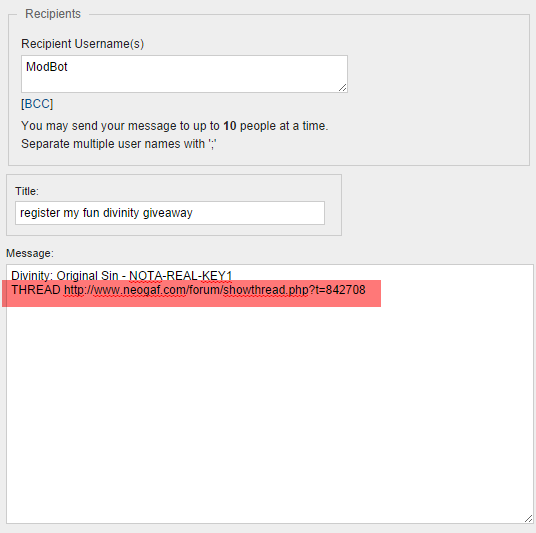 Guide to Giving Stuff Away with ModBot. ModBot is a GAF posting bot that you can use to give away games or anything else to your fellow users. 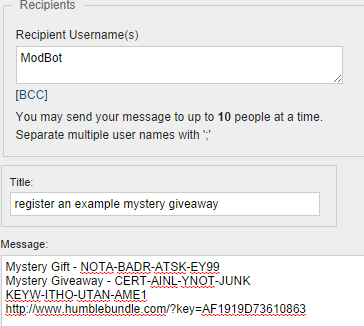 You are not obligated to use ModBot, feel free to use other giveaway services or none at all. But it can save you time and keep your keys safe. 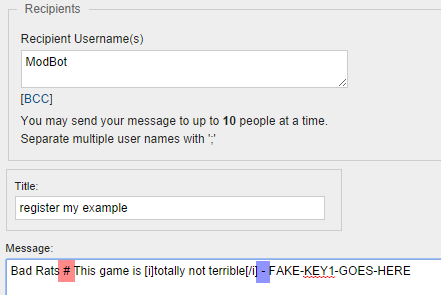 If you post game keys in a thread, they will be immediately and anonymously claimed, most likely by people who do not have GAF accounts. The thread will become a derail as users with accounts try to claim the keys and find they are already taken. Then, you will have to edit out your post to reflect this fact. ModBot saves you the trouble. With a ModBot giveaway, after one quick private message to ModBot, you have a secure, encrypted way to give away your games, see who claimed them, and apply rules to restrict winners to certain categories of user. ModBot will automatically edit out games as they are claimed. It is public, fair, accountable, and easy to use. Haven't I seen ModBot lock threads before? What's the secret? ModBot also has moderation functions. Moderators and Administrators can use ModBot to do a variety of administrative functions faster, especially when moderating from mobile devices. One of the functions ModBot has is to allow a moderator to lock a thread and leave a message describing why without identifying the moderator who locked the thread. Behind the scenes, the moderator who locked the thread is still recorded. Every moderator has access to ModBot. ModBot is not an actively maintained account, so sending complaint PMs to ModBot will not get you a response. PM a moderator if you have moderation questions. This thread is not about ModBot's use for moderation purposes. Some images used by ModBot were made by community members, including alr1ght, jshackles, and KenOD. How do I give away something using ModBot? ModBot will send you a PM within a minute or two. Open the PM. This PM echoes back the games you sent, but includes secret encrypted keys for them, hiding the actual game keys from prying eyes. Only the winner will get to see the real key. Follow the instructions by QUOTING ModBot, and then copying and pasting the resulting text in the thread you want the giveaway to take place in. When you post the text inside the thread, it will appear formatted. As you can see, the posts include instructions for how users can claim your games. When they successfully claim a game, the game will be edited out of your post and you will receive a receipt. 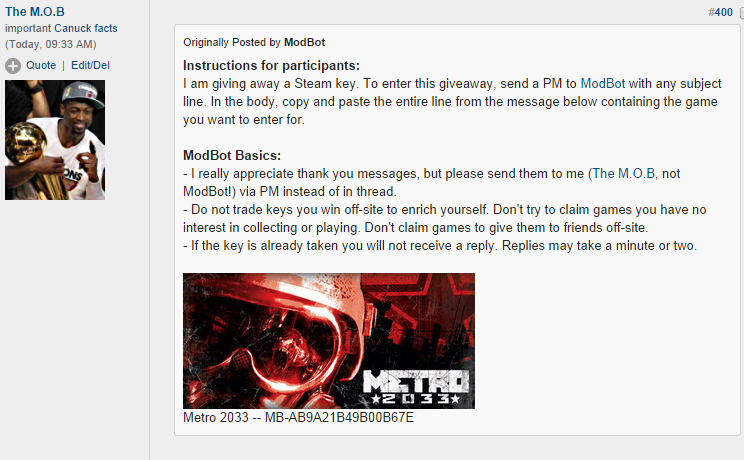 You don't need to do anything more, ModBot takes care of sending the real game keys to the user who wins them. If you are confused about these steps, try this animated GIF tutorial. If you are giving away something outside the Steam thread, please review this post. There are some things you need to know. It will only take a few seconds. Please see the next post for more advanced information about using rules with your giveaway. What can I give away with ModBot? Literally anything. If you obey the format listed above, ModBot will accept any code. We've had people give away PSN and Xbox Live codes, and even a smartphone. Thank you very much for being willing to give away whatever you're considering giving away. I am sure the recipient appreciates it greatly. If you use the RAFFLE or RAFFLE24 rules above, and you are posting in the Steam thread, you can add the AUTOREPOST rule to have ModBot automatically bump your raffle. 3 hour raffles get a single bump, 1 hour before their deadline. 24 hour raffles get two bumps, one after 12 hours, and one 1 hour before their deadline. This is optional, but might save you some work. * There is a grace period: users who posted 5 or more posts in the LAST Steam thread also count. This will restrict the giveaway to previous givers who have given at least 25 games*! Great if you want to give away a big deal game and really want to make sure it goes somewhere worthy. This will block that username from participating in specific. - Game Name and comment must be separated by " # ". Space pound space. Comment and game key must be separated by " - ". Space - space. - You can leave a comment for each game in your giveaway, or just some, or none at all. - You cannot combine comments and trivia giveaways. - Each game in your giveaway can have a different trivia question. You can also have some games have trivia questions and other games just be free and clear giveaways. You must include the TRIVIA rule even if only some of your games have trivia questions. You should only include the TRIVIA rule once. - Trivia questions can have multi-word answers. Capitalization does not matter. Punctuation does not matter. Some effort is made to standardize numeric entries, but it's not perfect--I would not advise doing trivia questions with numeric answers. Articles like "the" do not matter, but I may have missed some, so try to avoid answers which contain articles. Spelling does matter and variant spellings are not accepted, so be especially clear if the answer has multiple spellings or variant spellings. Answers must fit on one line. - Trivia works on anonymous giveaways, but remember that you cannot preview the layout so make sure you got everything right. - Trivia works with other rules; the entrant will have to get the trivia question right AND satisfy the other rules. - Entering counts as an entry,. so if you get the question wrong, you cannot enter again. - It is optional whether your question ends in a question mark. - Game name and Question must be separated by a space, two question marks, and a space. Question and answer must be separated by a space, two question marks, and a space. Answer and key must be separated by a space, a dash, and a space. You did not put a " ?? " delimiter between the game name and the question. You chose an answer with variant spellings. You attempted to combine comments and trivia. Your answer is unnecessarily precise and will almost certainly not be correctly guessed. How do I get games to give away with ModBot? There are three basic ways to give away games: keys, redemption links, and gifts purchased on Steam. Keys you can get by buying games on sites like Amazon, GetGamesGo, GamersGate, GreenManGaming, ShinyLoot, GameFly, and others, as well as Indie Bundle services like IndieRoyale, Groupees, Bundlestars, and other services. Once you get them, simply give them away, no problem. Redemption links are a little more complicated. You get these when you want to share games bought on Humble Bundle or IndieGala. Mostly the sites that use redemption links have instructions on how to get links--you want to follow the steps required for gifting games to friends, and use the link you would share with friends as the key for ModBot. An example of this is found in the tutorial above. You can see instructions for how to share games bought on Humble Bundle by clicking here. Finally, you can of course give away games you bought on Steam for the express purpose of giving to people. This is a pretty simple process, but requires a little extra work compared to the other types of game gifts. GRIEF.EXE made a helpful tutorial which you can access here, but the short version involves buying the game as a gift on Steam, emailing the gift to yourself, and getting the redemption link from your email. In the future, I hope to expand ModBot to directly take gifts on Steam. 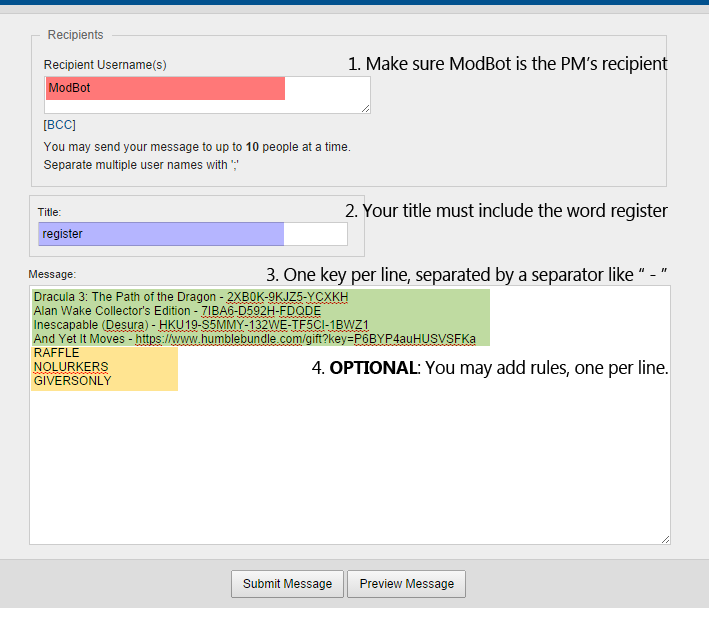 ModBot supports a variety of support-related PMs that can handle common support tasks for you. I made a giveaway but realized I want to change the rules after the fact. Can I do this? How do I see what I have won in the past? How do I see what I have given away in the past? How do I know what I have unclaimed right now in ModBot? I won a game and didn't receive the PM or lost the PM with the key. How do I fix this? What happens if I want to repost a game that's already been posted? Scenario 1: I posted a game and no one claimed it. I want to repost it with less restrictive rules. Scenario 2: I claimed a game and found out I already have it or don't want it. / I posted a game and someone claimed it and found out they didn't want it or already have it. First, please don't enter for games you don't want. If you think it's likely you'll buy the game, just don't enter. Don't enter every giveaway just because it's there. Enter the giveaways you want most. Be fair to other people. Scenario 3: I just did scenario 2, but ModBot still won't accept the key. This sometimes happens, especially with redemption URLs. In this case, if you are 100% sure that the key/URL is not claimed, add an ampersand at the end of the URL when you submit it in your new giveaway. What happens if I enter for a raffle and discover I don't want it BEFORE the raffle is drawn for? How do I disqualify myself? People won't claim this random game I'm trying to give away, but it's really driving me nuts to see it in my list of games. Can you take it off my hands? Someone is being a mega jerk and I want to block them permanently from ever entering my raffles again. / Someone won a game off me and sold it for a profit or otherwise did something totally unacceptable. I posted a 3-hour or 24-hour raffle and it's totally buried in the thread can I repost it? My giveaway ended five seconds ago and it hasn't yet been edited out. Is ModBot down? Shouldn't you be fired for doing such a bad job running this service? Invest some of the millions you make off ModBot to improve functionality. My giveaway ended a long time ago and still no one has taken it. I can't possibly believe no one wanted this game I paid eleven cents for in a bundle and have never played. Is ModBot broken? I entered for a giveaway and didn't win it. No one else won either. Then, later, someone else came along and won. Why didn't I win? I was just throttled for a big cash value giveaway because I won a dozen small crap games this week. Why should I even bother entering for the smaller games if it's going to turn around and bite me? I used to win games all the time, I've won hundreds of games, but now I can't seem to win any anymore. What gives? No really, why do I never win? Am I blocked? Can you tell me if I'm blocked? Am I on the permanent block list? Did someone block me from their giveaway? Is the reason why I'm not winning because I'm blocked? A select list of games that are widely considered to be irredeemably bad. Most are sub-50 Metacritic. No, you can't have the full list, but nothing on it is my opinion or pushing an agenda, it's all based on near-universal agreement that the games are terrible. How do I do a Mystery Gift giveaway? 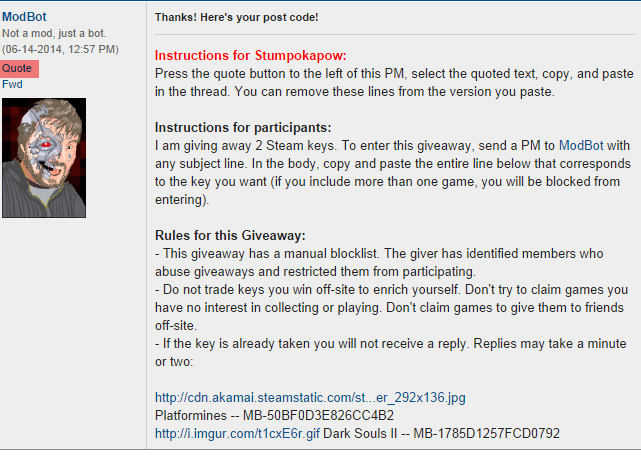 Can I edit the formatting for ModBot stuff once I've posted the giveaway? How do I tell what length to make the giveaway?